Mange is caused by a mite called sarcoptes scabiei. The female mite tunnels into skin depositing eggs creating fine hairpin tunnels beneath the skin. This causes intense discomfort and, over time, thick scab-like plaques form over the animal’s body. They are dry and draw the skin together. Hair falls out. Cracks become flyblown and infected. It causes intense, constant itching which lasts for months and animals will become temporarily blind and deaf due to plaques growing over eyes and ears. Without treatment it is fatal … and it is a slow, painful death. Ironically in dogs and humans (when mange is known as scabies) the infestation is able to be eradicated fairly easily. Wombats have no immunity to the mange mite which suggests it was introduced to them through human activity. 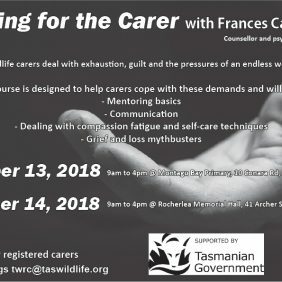 Wildlife rehabilitation groups tried taking ill wombats into care and bathing them, however they died, so some still believe you cannot treat a wombat with mange. Some argue the animal is likely to die anyway so should be shot, not treated. This is a circular argument: by doing nothing we ensure that not only will any wombat getting mange die, but we promote its spread through wombat populations. 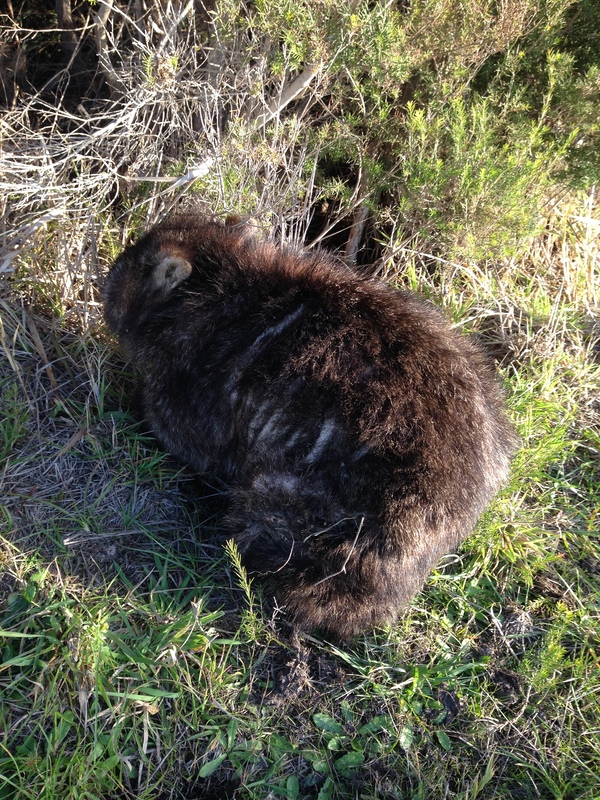 Veterinary injections, spot on and pour on, treatments can be used successfully to treat mange in wombats in care. Unfortunately, none of these will stop the animal getting another infestation. Until there is a vaccine (which is highly unlikely) or permanent means to eradicate mites, this will continue to be the case, just as it is in scabies infestations in humans and in other animals. However, treating wombats with infestations not only lessens their discomfort but kills those mites and stops them spreading to another contact. The one study on sarcoptic mange mites in wombats conducted in Australia in 2001 indicated blood changes in wombats with mange, so over time it has a systemic affect which leads to death. The same study also showed once mites were removed, the wombats fully recovered, however antibiotics were used as well in this treatment regime. (Skerratt 2001). One of the most significant issues for manged wombats is secondary infections. Once these develop, life becomes more difficult for wild wombats and it is more difficult to recover. It is important to try and get treatment as soon as the animal shows any signs of scabs, hair loss or behaviour change (eg being out during daylight hours). Research still needs to determine if the mites on wombats have come from the primate or canine strain. We do not know whether the mites have become host-specific or if wombats are affected by a sub-species of the mite. 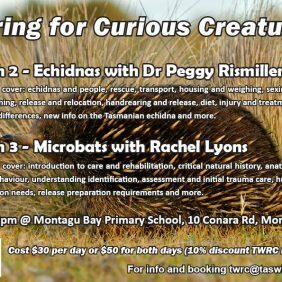 The Wombat Protection Society is working to develop a research program to address these questions. Simply by reading this you now know more about wombat mange than most people. You can help by making a donation or finding out how to assist your local contact. You can also assist a wombat with mange by supplying the wombat with water and helping get treatment for it as soon as possible by contacting DPIPWE. 1. 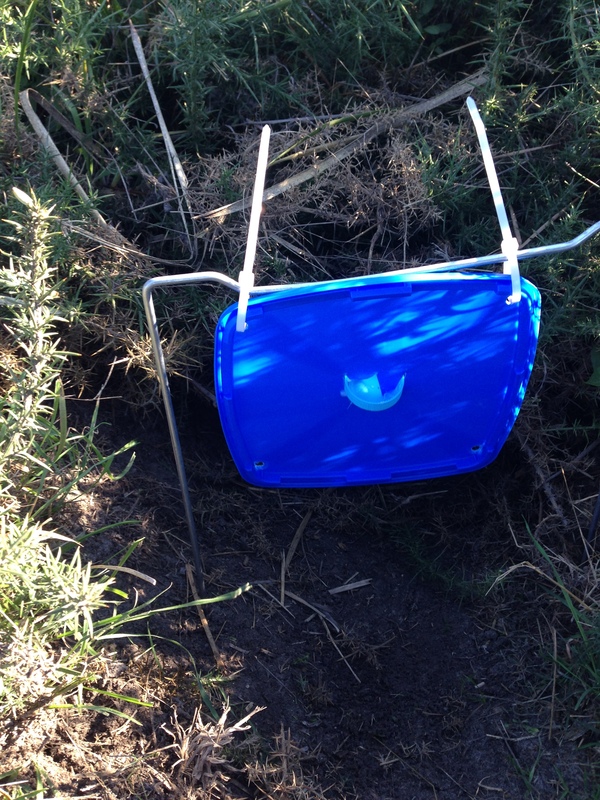 The Burrow Flap Method – using a simple ice cream container lid and a metal frame, a measured dose of the chosen treatment substance is delivered quickly and easily. 2. Pole and scoop – the pole and scoop method is used primarily when animals are so badly affected that they can be approached and treated. A small plastic scoop is attached to a broom handle and the treatment substance is delivered manually.